Join our master cooper and learn the techniques, terminology, and processes necessary to fashion round containers made of wood. You will plan your design, understand the different types of woods used by coopers, and identify the direction of the grain to give you the best results. Next, you will work with traditional tools, such as draw knives, a croze, a cooper’s anvil, and a jointer to shape staves which are the basic pieces of every cask, barrel, and pail. 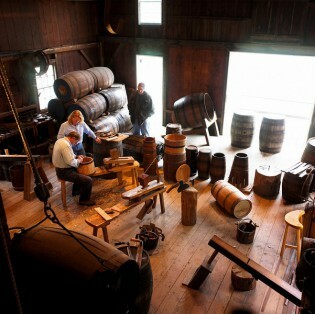 The results of your hard work will be a bucket of the sort that was used on the 1841 whaleship Charles W. Morgan and in homes throughout the world for centuries. The class will meet for three 6-hour days during the month of January, as determined by the Cooper and students. All tools and materials are provided. Group lessons are limited to three students. This class is for ages 16 and older.